Ivana Rogar was born in Zagreb in 1978. Her first collection of short stories, Tamno ogledalo (2014) (Dark Mirror) was awarded as one of the best Croatian books of fiction that year by the Croatian Ministry of Culture. 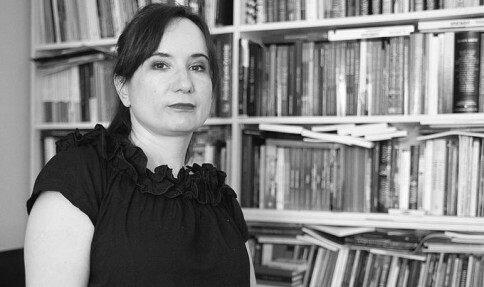 Her next collection of short stories, Tumačenje snova (2016) (Interpretation of Dreams), received the prestigious Jankov Polić Kamov award for the best literary work published that year. Rogar earned her bachelor’s degree in Comparative Literature and English from the University of Zagreb. She is an editor for the publishing house Durieux as well as for the reputable literary magazines Quorum and Libra Libera. Rogar’s work has appeared in a number of Croatian and regional magazines including the Croatian Film Chronicles, 15 Days and Zarez among others. She has translated seven books from English to Croatian, including the Man Booker prize winner The Inheritance of Loss, by Kiran Desai. Several poems she translated from Serbian to English were published in The Café Review alongside one of her own poems. They began coming in even larger numbers, and, upon waking, we found many of their bodies beneath our beds and beside windows where they entered at night. They lay with their legs in the air. The survivors scrambled along kitchen tiles, hid beneath an old cupboard and chests, and looked for cracks in the walls. “I have never seen so many of them,” said Marta, disgusted. She was afraid they would creep up into her bed at night, and she often woke up to check if her sheets were clean. The invasion was harder on her than me. I did our grocery shopping. The store was three miles away from our rented house. Walking down the road, I noticed hundreds of those insects slowly crawling in rows along and across the asphalt. They were black and large; even the smaller ones were big, and, watching them, one would involuntarily think that things would not be so bad if the insects were not so big. Their bodies glistened in the sun like polished metal. Eight tiny, relentlessly twitching legs protruded from their bodies. Many of them died on the road, because every now and then a car went by and crushed their hard armor. We stomped on them, too, because in July they were already everywhere, and we could not watch out all the time to see if any of them were under our feet. Nevertheless, we tried to avoid them, since the sound of their bodies tearing was awful. The summer was hot, without rain, and the cloudless sky gleamed like a mirror. Raising our eyes to see the sun was difficult. We slept separately, because our joined bodies produced double amounts of sweat. But sheets that were wet in the morning dried by noon and looked fresh again. Marta got up at six, while it was still chilly, and wrote beneath a plastic awning on the porch. In four hours, she would write a few pages and then read them through. It was her third novel, a tool for whitewashing the remains of her previous life, which she did not want to talk about. She would say, “You will know it when I’m finished.” I did not want to push it, so I waited for the day when she would show me what she held inside herself. I woke up late, like back at home, when the sun had already heated up the narrow patch of asphalt that wobbled by the house. Marta would sit in the shadow of the awning and fan herself, drops of sweat trickling down her neck and breasts. I would look long at that beautiful body, so much prettier than mine, thickset with small breasts. I imagined some other hands touching it, whether male or female, I did not know.